Same-day emergency service available! Wrought iron repair pros! 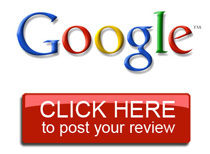 ​Hello and welcome to Red Rock Fence Repair Company. While competing fence companies in Dallas, TX may treat fence repair as side work or a way to up-sell you on an expensive new fence, we specialize in high quality fence repair work with an added emphasis on wrought iron fence restoration. It's this simple philosophy that makes us the only true fence repair company in the Dallas area. No matter what your repair needs are, we have you covered. We specialize in all fence repair work and no job is too big or small for our crew. Thank you for your consideration. If you are thinking about selling your home or are just tired of your old grey fence, give us a call today! For a fraction of the price of a new fence we can repair or restore your old fence and have it looking new again. This service helps your home sell faster and adds years back to the life of your fence without breaking the bank. Staining available upon request. 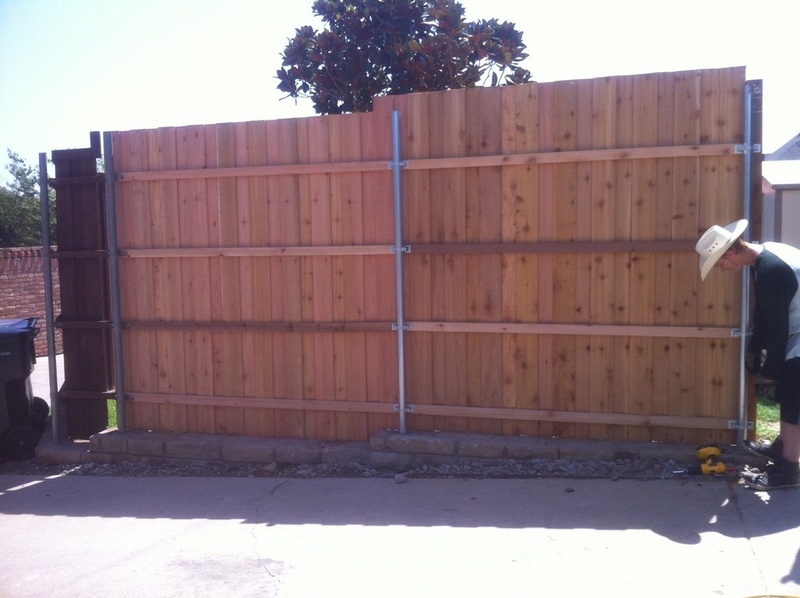 Types of fence services include wood fences, cedar, vinyl, wind damaged, chain link & more. With your help and just a few minutes, most fence repair estimates can be done by phone. 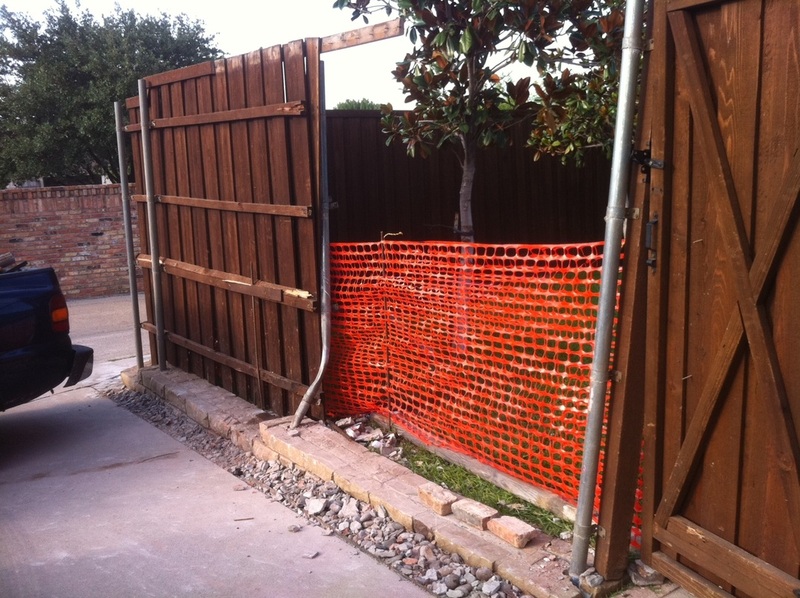 Call now to discuss your fence replacement needs at 214-799-5190. Links and resources: Serving the entire DFW metroplex including Plano, Frisco, Allen, McKinney, The Colony, Carrollton, Lewisville, Prosper, Coppell, Richardson, Little Elm, Hurst, Euless, Bedford, Garland, Farmer's Branch, Grapevine, Irving, Mesquite, The Colony, Grand Prairie - Sachse Wylie - Flower Mound - Southlake, etc. Also offering fence staining services on request and patio + arbor staining. Other cities. Our main zip codes of focus include 75205 75214, 75230, 75248, 75229,75209, 75225, 75240, 75252, 75204 and more. Call us anywhere in the metroplex! This is a conventional pale fence with both variety and character. From the stately corner post, with its decorative orb and raised panel and rosette appliques, the fence's scalloped design rises and falls rhythmically. A sloping picket line crest at a center pointed picket, then dips and crests again at a broad-width picket cut in an imitation post style. The combination of scallops and imitation posts is surprisingly easy to construct and gives this fence a cosmopolitan appearance. This design is ideal for almost any house, from Cape Cods and rural cottages to country chateaus. The pointed pickets are a breeze to cut using a band saw, and the sloping pickets are twice as easy to cut. The imitation post can be cut using a band saw. If making several imitation posts during a repair job, use a router and a pattern to speed the cutting process. Assembly and construction of this fence are fast and easy. The post's ornamental finial can be cut using a band saw or turned on a lathe. The beveled cap can be made using a table saw or with a router and panel raising bit. The decoratively molded baseboard adds character to this fence.